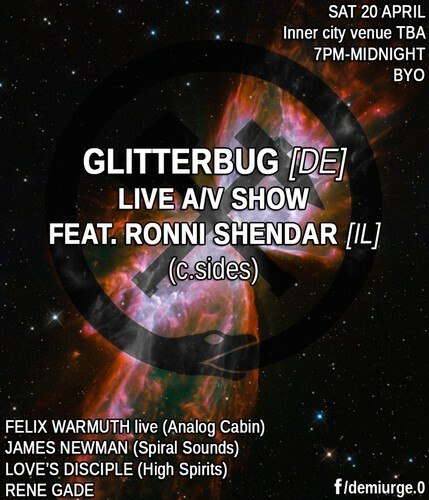 Demiurge returns with another live act's Sydney premiere, a duo comprised of Glitterbug (aka Till Rohmann, sound artist and composer from Germany) and Ronni Shendar (visual artist and curator from Israel). Glitterbug’s output has been featured on Mule, Ghostly, Notown, Ki, and his own c.sides label. Shendar, widely known for directing Gold Panda's and Christian Löffler's music videos, works solely with her own materials to translate the music to a cinematic language of unfolding layers, textures, and landscapes. Till’s live sets incorporate a wide range of analogue equipment on stage to construct his rich, warm sound. Their decade-long collaboration has brought about a symbiotic approach to audiovisual performance, culminating in an immersive and mesmerizing experience for audiences worldwide.